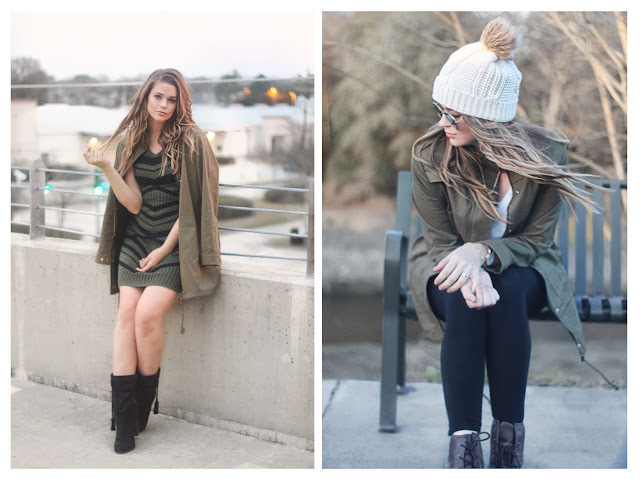 The Army Green Utilitarian Jacket has been a wardrobe staple for the last few years. I still remember when I started seeing it in Stores down here years ago and wishing I had the guts to wear it. Now, it's so common place, I 'm pretty sure everyone and their mom owns some version of it. But, now, what I keep noticing everywhere... From Kim Kardashian to my Fav Beauty Bloggers on Snapchat... is that the jacket is working it's way into dressier looks. By popping it over a cute dress before you head out for the evening you give yourself a tough, cool girl look that you won't get from your more basic coats. "Yes, I slayed tonight, but I just grabbed this coat on the way out, because it's a little chilly and I'm so effortlessly cool that I don't need to spend hours and hundreds of dollars on my outerwear". That's your inner monologue in this look. Do you have an inner monologue? 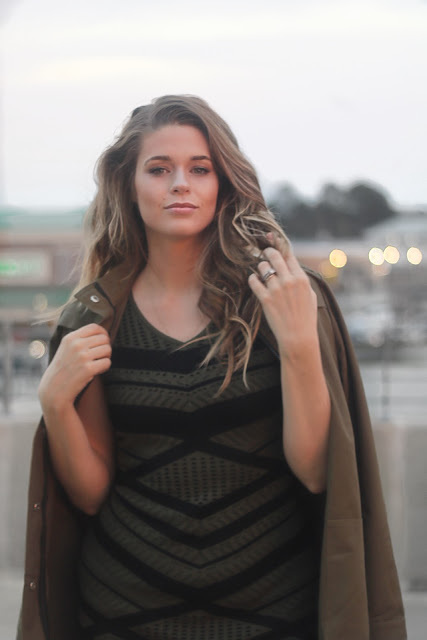 This coat is only $20 and you can grab it here. Other outfit deets are linked below! I love this coat and never would've thought to dress up like that! Beautiful! Thank you Patricia! I love pieces that have so many uses! Obsessed with this coat and love how you styled it two ways!! Love how you styled it up + down! Such a versatile piece! That jacket is amazing! It looks great with everything. I have an army green military style jacket similar to yours and I am aways surprised by how much use I get out of it!! 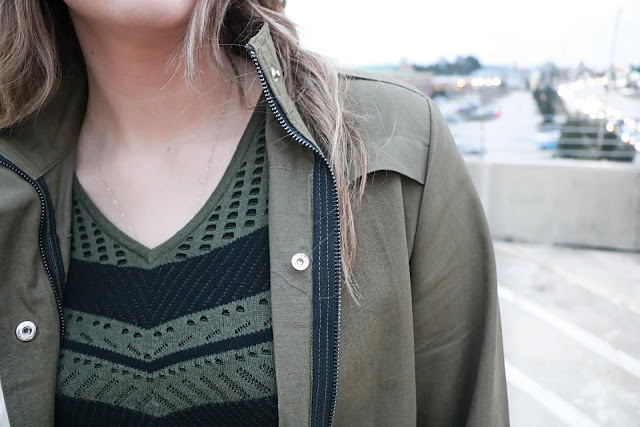 It's really versatile and the color is pretty neutral! Love the way you styled yours!! XOXO Have a great week love! 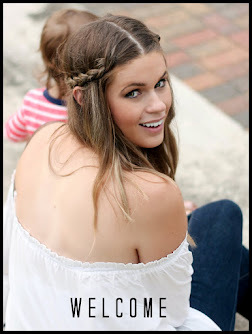 Love how you styled it with your knit dress! SO chic! This is DARLING! Girly AND grungy! Love it! I love this coat! The pictures are beautiful. I can't live without my jacket...and I love the way you styled yours. So cute. I love a good staple piece! And thank you!! So great to have a coat that does double duty. The color is great looking. Yes! Double duty is the way to go! I love anything I can get lots of use out of! Haha, it is the same here in Louisiana. I spend so much time obsessing over sweaters and coats that I get to wear only a couple of times. Luckily this one is like the perfect weight for me. Light but not so light that it's pointless. Cutest look. EVER! And inexpensive!? YES YES YES!